I'm a big fan of spring fashion campaigns, right now. I'm so ready for spring fashion. One of the biggest trends for Spring 2012 is pastels. 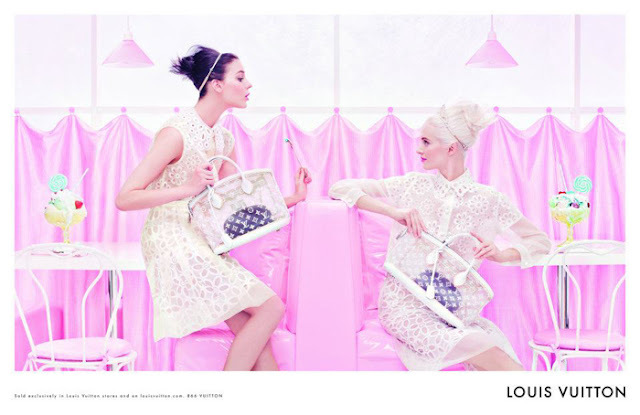 Louis Vuitton did a great job of portraying this trend in their Spring/Summer 2012 fashion campaign. The campaign takes place in a light baby pink sweet ice-cream parlor. The theme of the campaign is "very soft and very sweet, yet at the same time bold and very graphic". The delicate white laced dresses look oh so pretty! The fit in perfectly with this whole whimsical scene. The ice-cream sundaes look yummy! I love the metallic heels! They are just as eye-catching as the cute little swirly candy on the milkshake! This campaign is just feminine and fun! Marc Jacobs executed the concept perfectly. I loved everything about the campaign, from the delicious sweet treats to the lovely lace dresses! And we cannot forget about all of the pretty pastel shades that added to the girlish splendor. 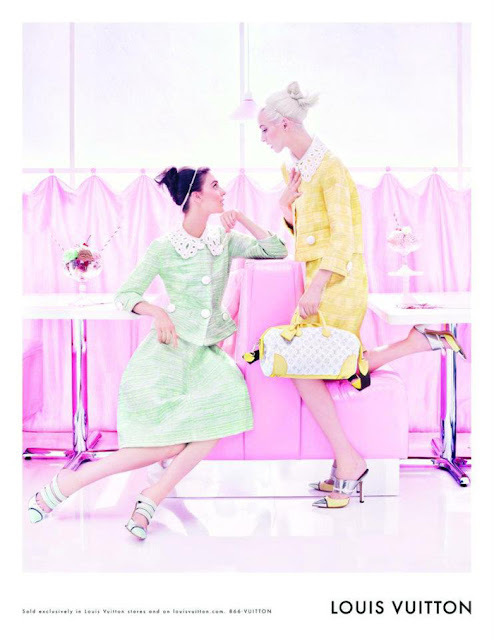 This campaign makes me want to live in lace dresses and pastel shades all throughout spring and summer!